I’m Back, Baby! (Giveaway!) 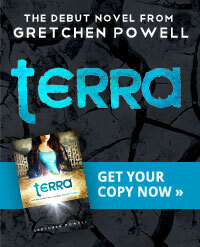 | Honey, I Shrunk the Gretchen! EDIT: This giveaway is now closed. To see if you were one of the winners, click here! Getting to spend the week in Texas with my sister, her husband, my parents, and my brand new baby niece was amazing, but it may surprise no one to hear that it wasn’t really a vacation in the traditional sense. Nope, up by 7 every morning, helping to change poopy diapers, and watching a LOT of TLC (okay, well, that part was pretty vacation-y, heh), I almost feel like I need a vacation from my vacation! Alas, that won’t be happening (at least not until Sean’s and my epic Ireland trip in July!) but at least now I’ll be back on a (hopefully) regular blogging schedule. 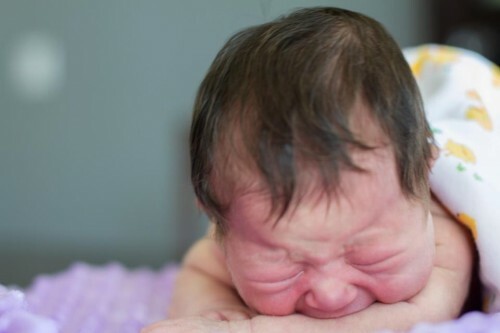 Part of my going down to Houston was to do a newborn photo shoot with baby Amelia! I’ve only just started editing some of the photos, but in case you haven’t already seen these plastered all over social media (and apologies if you have, hehe), take a look! Speaking of Houston… so. My sister, who some of you may already know works for UnderArmour, sent me home with a smorgasbord of UA goodies. 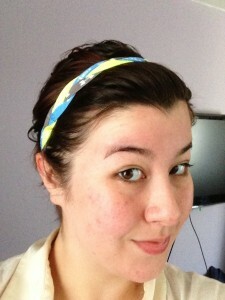 One of the things I was sent back with is an exclusive collection of awesome UA headbands! They look really great AND are super functional for working out. They feel nice but are grippy (without tearing out hair or anything horrible like that). Even though my hair is super straight and sleek, they really don’t slip very much! This particular pack comes in really fun blues and greens. I get compliments on my UA headbands ALL the time when I wear them, and I want you guys to experience the same! I’ve got FIVE (yes, five!) packs of headbands to give away to you guys! To enter, simply leave a comment on this post telling me what your favorite thing about Spring is! As always, extra entries for those who follow me on Twitter, Like HISTG on Facebook, and tweet/post about this giveaway. Just make you sure you leave separate comments back here for each thing you do! I’ll pick the winners on Friday, April 5th. Note: This giveaway is not sponsored in any way by UnderAmour. I just have the good fortune to get freebies through my sister, and know I’m not gonna need 20 more headbands to add to my own collection, hahahaha. My favorite thing about spring would be the colors. 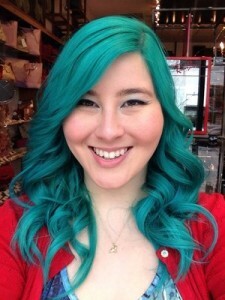 I love all the fun pastel colors and who doesn’t like Easter candy in fun colors? Favorite thing about Spring is definitely being able to, you know, go outside without my face freezing off. Haha. Love the baby pics too! Soooo cuuuuuuttteee. I love Spring because the baseball season starts and we are a family that loves our baseball. Congrats on your niece! My sister-in-law had our newest nephew last week and I’m already in love. My favorite thing about spring is more sunlight! It feels so much nicer to get home while it’s still light out after my long commute. My FAVE thing about spring is flip flops! My favorite thing about spring is the daffodils!! My favorite thing about spring is wearing dresses!! Yay congrats on your beautiful niece! I’m going to be an aunt for the first time this summer (to a nephew!) and I could not be more excited. My favorite thing about spring is when my garden starts coming back to life, finally, which is appears to be doing as of Friday (we’re having an unusually cold spring in Chicago). 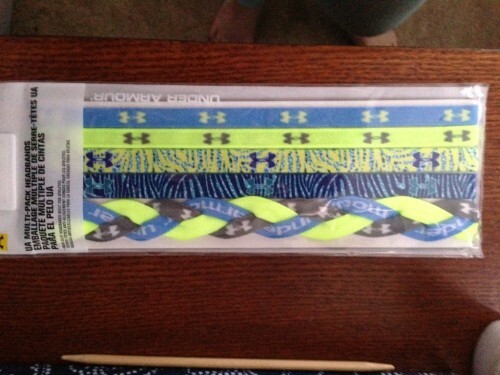 I am obsessed with Under Armour, and have had my eyes on these headbands! My favorite thing about spring is the return of sunshine to Michigan where I live! I also like on Facebook! My favorite thing is warmer weather! Even though it was a relatively mild winter, this past month or so has been ridiculously cold and I’m over it! I already like you on Facebook too. My fav part is a nice warm run in the sun! Ooh! Love all the pictures! I’ll need to come back to read later.. My favorite thing about spring are the little yellow footballs goslings, that appear at work 😀 They’re so cute! My favorite thing about Spring is not being so cold anymore! Unfortunately, Boston isn’t cooperating this year! My favorite thing about spring is I can go back to flip flops instead of wearing shoes all the time. Freedom for the toes! I follow you on twitter and liked you on the facebooks. The ability to do some cardio outside is what I lurve about spring!!! Also, looooove all the pics of little Miss Mia 🙂 Can’t wait to see more! Glad you had a great trip! My favorite things about spring are flowers, sunshine, flip flops, and finally feeling justified splurging for a pedicure. Being able to run outside! Oh, such a fun giveaway! My favorite thing about Spring is definitely being able to get outside more. Oh, and I love opening my windows for a some cool air! My favorite thing about Spring is FINALLY being able to walk my dog for more than 5 minutes and not dreading it, because the weather is finally nice :). And gardening, I can’t wait to start my garden! I also follow you on the Twitterz. My favorite part of spring is usually the lilies coming up. But this spring it’s got to be decent weather. Our heater broke and its not in the budget for a new one so we are riding out the weather with space heaters until we get a new one in a few months. Come on, warm spring weather! I love spring because…. WINERIES. Need I say more!? My favorite thing about Spring is the weather…not too hot and not too cold! I don’t Twitter, but I shared on Facebook. BTW great pics of a beautiful baby! spring? what is this spring you speak of? i’m in pennsylvania and there is no sign of it yet. If it ever shows, the sun, the warmth and the flowers are my favorite things. My favorite thing about spring is probably seeing new leaves on the trees & flowers budding again… I can’t wait for that to start happening in Pittsburgh! Oh! Your niece is adorable! My favorite part about spring is all the flowers. Bring on the pretty! Congrats on your niece! My favorite thing about spring is to go running outside again! I love the cool weather and all the trees and flowers beginning to bloom! I love the colors of spring! especially the ones on Easter eggs! The best thing about spring is the days are longer. 🙂 Your niece is beautiful! As a fellow washingtonian-the cherry blossoms! My favorite thing about spring is being able to ditch my car for my bike! my favorite thing about Spring is flowers and blossoms and new leaves…after a dull, brown winter I am ready for color! Warm weather! I’m still waiting for things to heat up in DC so I can get some outdoor runs in! 1) That child is adorable! 2) Spring isn’t really my season. It feels like it only lasts about a day sometime between winter and summer. The only thing good about it is the anticipation for summer. 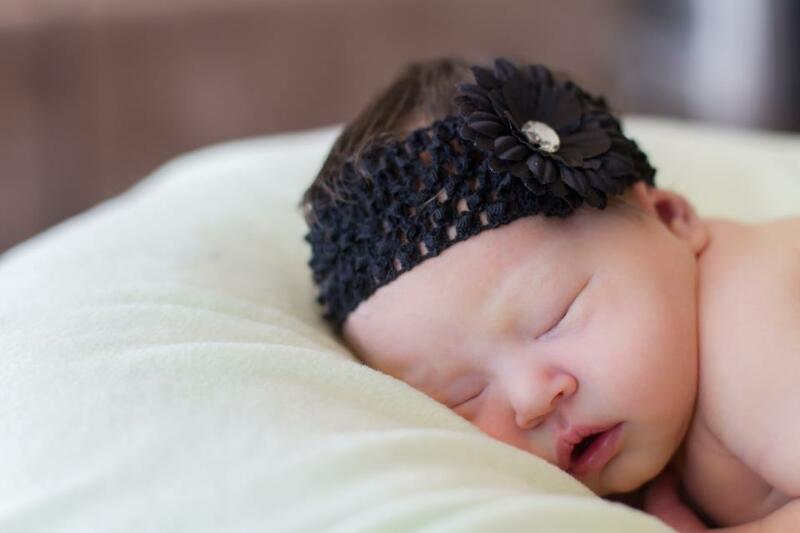 Baby Amelia is simply adorable! Congratulations again! 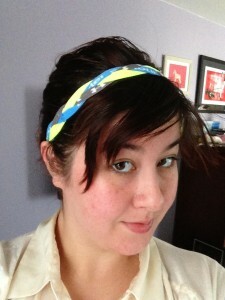 Those headbands are adorable and just what I need to keep my bangs out of my face. My favorite thing about spring is seeing all of the pretty wildflowers blooming!! My favorite thing about spring are the tulips that are planted along Michigan Ave. in Chicago. I love being able to run outside in the Spring. I know pollen is a killer, but I just cannot help lacing up my running shoes and hitting the pavement as soon as the weather breaks. This past Saturday in the DC Area was gorgeous! I follow HISTG on Facebook. I follow HISTG on Twiiter. Ahhhh…I’m dying to go to Ireland someday! It will happen one of these days 🙂 I’ve been reading the recaps from another blogger (Julie @ PBFingers.com) on her recent trip to Ireland. Even with not such amazing weather for her trip, it was still absolutely breathtaking. She had some great tips for some places to visit and eat. I would love, love, love those headbands! My favorite thing about Spring is…um… (I live in South Florida, so it’s pretty much exactly the same thing weather-wise as it is the rest of the year) some of my flowers start to bloom again! Congrats Auntie, she is beautiful. …when the first bud opens up in Spring…. Best thing about Spring is playing in the park with my baby, and running outside! Looove to love you on FB! Amelia is ADORBS. For real. Annnnnnd, those headbands? WANT. I’ve always wanted some UA headbands because they are SO cute (as well as functional), but I could never justify it when I could get some lame version from the drug store. That being said, my favorite part of spring is just slowly watching everything turn green. Call my CRAY CRAY, but I LOVE the rainy weather spring brings! It feel replenishing, nourishing. It wakes everything up and makes it new. Love! And I totes tweeted about the giveaway! Plus, not only do I LIKE you on Facebook, I LOVE you on Facebook. That came out way creepier than I intended it to. I love spring because of the azaleas and being able to go to the beach, but the pollen is awful! Congratulations on your niece – she is 100% adorable! My favorite thing abt spring is not having to wear pants everyday! I love sundresses and jhorts and sandals. They just make me so muh happier! My favorite thing about spring is that the weather gets warmer…and my dry skin problems miraculously disappear! I like HISTG on Facebook! My favorite thing about spring is that I get to wear lighter clothes and not heavy jeans and sweatshirts all the time! My favorite thing about spring is going for walks in the evening! I love that it stays light out! My favorite part of spring is to be able to wear my jeans, tank top and FLIP-FLOPS!!!! I can’t wait to be able to run outside and wear capris and sandals! My favorite thing about spring is having the windows open! Not being cold while I’m walking the dog. And grilling out on our back deck. Al fresco dining, ugh, can’t wait for it to warm up! I love that the sun has come out and it’s daylight when I leave work. Running outside in nice weather > running on the treadmill. 🙂 Also, congrats on the new addition to your family! 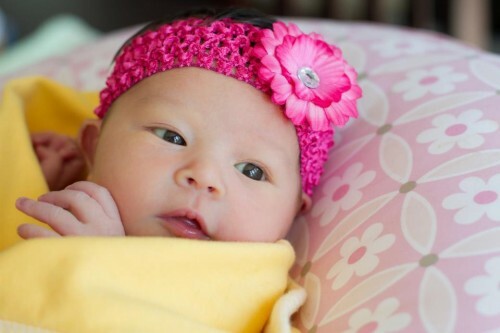 That first pic of your niece is so precious! She is super alert. And my favorite thing about spring is being able to workout outside and having longer days! Extra daylight in the evening so I can get my run in after work and sleep a little bit later in the morning! Oh, and of course the smell of the flowering trees and I run past! My favorite thing about Spring is getting to do more activities outside! I won’t have to wear a coat and scarf while walking in Great Falls. I already like HISTG on Facebook! I like the extra hours of sunlight at night. LOLZ NO I am not sitting this one out. This is cheesy, but my favorite thing about spring is cherry blossoms. Watching an often-disgusting city turn into a big pink and white princess fest helps distract me from the fact that Chinatown smells constantly of pee. Though, after your vacation, you’re probably more of a pee expert than I am. You will come to wherever I am when I have babies to take pictures of them, yes? They will likely be dressed in cowboy hats and leopard print. My fav thing about spring is outdoor patios for brunch, happy hour, dinner…and everything else! P.S. Facebook. Give me all the headbands. Spring? I wish– it’s snowing like crazy here! I’d have to say my favorite thing about spring is walking my big fluffy St.Bernard along the lakeshore really early in the morning, watching a faint steam coming off the lake. Ahhh :D. Can’t wait! your niece is just beautiful! I love how each spring morning is so exhilarating. It’s brighter and warmer and nothing seems so bad when the birds are literally chirping their heads off and flowers are popping up everywhere. My favorite thing about Spring…..the beautiful flowers! Warmth!!! I love when it starts warming up enough to go barefoot without freezing my toes off! Usually my birthday but this year I’ll just be glad to run outside. I love fresh asparagus! And of course, those illusive days of sunshine. I am jonesin for driving with my car windows down and the smell of lilacs. My favorite part about spring is the nicer weather, just being able to head outside for a walk or run without bundling up or freezing, lol. My favorite thing about spring is 1. being able to hang out outside in my backyard again and 2. driving eith the windows down! Congrats on your new niece! She’s beautiful! That distinct fresh spring air smell! It’s intoxicating! My favorite thing about spring is waking up in the morning and walking outside- when it smells like spring and the birds are chirping. Its truly the best. My favorite thing about spring is that I can run outside! It stays lighter later for work days and the sunshine and temperature make these runs such a relaxing thing! I love the headbands to keep the hair out of my face. My favorite things about spring are the longer daylight and the end of snow! My favorite thing about spring is the sun/blue skies/birds chirping! It’s that feeling that everything has come alive again after such a long winter. I can’t wait until spring starts to be a bit more consistent, weather-wise, here in Ohio! Favorite thing: The WARM weather! I love being able to run outside, finally. I am not a quick runner, but I love being able to take my kid out and just run in the sunshine. I don’t hate the treadmill like some people, but running outside makes it even better. My favorite thing about spring is the longer days – it is SO much easier to get outside for a walk or run when I don’t need a flashlight to do so! And the same for facebook! I love the springtime weather! My favorite thing about spring is riding my bike everywhere! I love the green of spring. All the trees popping, the flowers blooming, the grass coming back to life – winters seem so brown and dreary. Bring on the green! My favorite thing about spring is taking walks outside with the stroller and admiring all the flowers. My favorite thing about spring is warmer runs in the sunshine…. no glove, no hats, no five layers of long underwear!!! My favorite thing about spring is the color that brings nature back to life. No matter where I live, spring perks me up because the trees and flowers start making nature vibrant again. Congratulations on becoming an auntie! I’m happy you’re back – I think we all missed you. Hope you had a great time with your sister and the new baby. My favourite thing about spring is the way the air smells. Your niece is one adorable behbeh!!!! My favorite thing about Spring is when all the flowers start blooming! My favorite thing about spring is, of course, the warmer weather! Hi Gretchen congrats, your niece is beautiful! My favorite thing about spring is the warm weather!! Oh man is she cute! Welcome back from your Auntie trip! I love the freshness of spring, everything just feels new! I love getting out for walks in the warmer air!! Your niece is absolutely adorable!! My favorite thing about spring is the warmer weather (perfect for running outside) and the flowers popping up everywhere. Awww what a precious baby girl, she is so adorable!! My favorite part about spring is being able to sit out on my deck after a long day to enjoy a glass of wine and some sunshine. A close second would be getting back outside to run after months of cycling classes and treadmill runs. My favorite thing to do when Spring rolls around is to get my garden ready for planting. My daughter likes to help me and it’s certainly a memory maker. My favorite thing is that it’s finally warm enough in Texas to start swimming again! So many things I love about spring – bike riding, not needing to wear 1,000 layers, and longer days! I love color! Green grass, sunshine, and blooms! I love the longer days in spring! And how it isn’t dark when I leave work anymore. my favorite thing about spring is that it is light when I go into work in the morning and STILL light when I get out of work. the sunshine truly makes me happy. I love the extra daylight! Favorite part about Spring is My Birthday! I LOOOOOOVE feeling the warm concrete under my toes in the Spring and seeing the flowers begin to poke out of the ground! My favorite thing about spring is picnics by the Charles River in Boston! Wow!!!! Cute babies!!! These photos are great!! !